Our structured group classes, enable you to progress through our skill level system with other participants of the same ability. There is a maximum of 8 pupils on each group lesson (A-D). A taster lesson is 1 Hour. Following lessons are 1.5 hour. We ask you arrive 30 minutes prior to the lesson start time to be kitted up. Lesson length includes de-kit and de-brief time at the end. As everyone progresses at a different pace, it is possible a certain lesson may need to be repeated. Click HERE for the next available lessons. Call us on 01283 890089 to book your lesson. 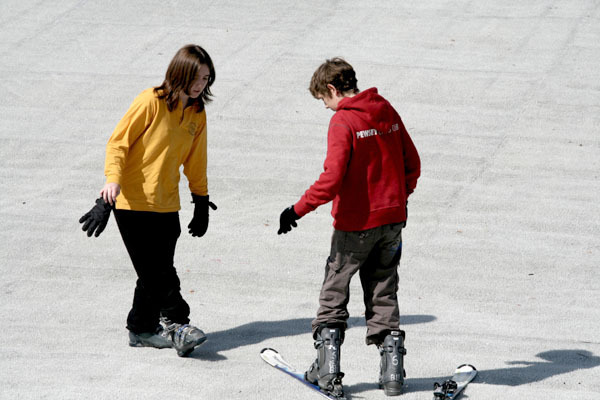 There is a minimum age limit of 9 years for snowboarding. Call us on 01283 890089 to book your lessons. Can already Ski or Snowboard? Need a bit of practice before your trip or just want to have some family fun? Book a private for your family. Pay an extra £10 per child per lesson. Walking with your snowboard: Be able to walk and turn on the flat, and walk up hill with your snowboard attached to one foot. Straight run: Be able to slide straight down the slope using a “run-out” to stop. Awareness of the Snowboard code: Understand the safety rules of the slope. Side slipping – toe and heel: Be able to slide down the hill at slow speed whilst balanced on heel or toe edge of board using the edge to control speed. Diagonal side slip – toe and heel: Be able to slide diagonally across slope in both directions on both toe or heel edge. Falling leaf – toe and heel: Be able to turn your board from a side slip to a steep angle and back again. Garlands – toe and heel: Same as falling leaf except a garland is in one direction multiple times. Use of lift: Be able to use drag lift comfortably and unaided. Falling leaf – toe and heel – into fall line: Be able to move the snowboard from a level side slip, both toe or heel, into the fall line (straight down the hill) while maintaining good posture and balance, then return back to controlled side slip using a controlled skid. Garlands – toe and heel – into fall line: Same as falling leaf, just in same consecutive direction. Lesson – 1.5 Hour Instruction: brushing up your skills. Enjoy a relaxed de-brief with your coach in our alpine lodge. Basic turn: Be able to get you board from level side slip to straight and back out on opposite edge making a C-shaped turn, e.g. heel edge-straight-toe edge. You will learn to be able to do this starting on either edge. Linked turns: Be able to link 2 basic turns together to make controlled S-shaped turns, e.g. hell edge-straight-toe edge-straight-heel edge. Intermediate turns: Be able to do linked turns at higher speed without slowing down as much between turns. Advanced turns / Carving: High speed turns down the slope using more edge and less skid to make the turns. A: We ask that you arrive 30 minutes prior to the start of your lesson, this allowing time for you to be checked in and where possible, we will kit you up prior to the lesson start time, enabling us to give you as much slope time as possible. A: We can take children as young as 3 years and up for skiing and children from 9 years and up for snowboarding.